Recommended Use for Males: As a dietary supplement, take 2 scoops (providing approx. 50 grams of protein) with 8-12 oz of cold water or any beverage you prefer. Consume 2-3 times daily for optimal muscle growth. To increase your protein intake per serving and achieve a delicious milkshake taste, use non-fat or low fat milk instead of water. Recommended Use for Females: As a dietary supplement, take 1 scoop (providing approx 25 grams of protein) with 8-12 oz. of cold water or any beverage you prefer. Vary the amount of liquid to achieve your desired consistency. Consume 2-3 times daily for optimal body shaping requirements. To increase your protein intake per serving and achieve a delicious milkshake taste, use non-fat or low fat milk instead of water. Mix 1 scoop of COMBAT PROTEIN POWDER® with 8–12 oz. of cold water. Vary the amount of water to achieve desired consistency and taste. To increase your protein intake per serving and achieve a delicious milkshake taste, use skim or low fat milk instead of water. Consume additional servings throughout the day to meet your daily protein requirements. Use in combination with whole food protein sources, a balanced diet, and exercise program. Due to the amount of active ingredients in this product, shake weekly and before use to ensure proper ingredient mixture and effectiveness per serving. Packed by weight, not by volume. Settling of product occurs after filling. Do not use if tamper evident security feature is broken or missing. Exposure to heat, light or air can affect flavor or aroma; therefore keep out of direct light or heat and store in a cool dark place. Keep sealed when not in use. This product contains milk and soy. This product was produced in a facility that may also process ingredients containing milk, egg, soybeans, shellfish, fish, tree nuts, wheat and peanuts. Inulin, Natural & Artificial Flavors, Cinnamon Bark Powder, Sucralose, Acesulfame Potassium, Salt, Potassium Citrate, Soy Lecithin. Recommended Use for Males: As a dietary supplement, take 2 scoops (providing 50 grams of protein) with 8-12 oz of cold water or any beverage you prefer. Consume 2-3 times daily for optimal muscle growth. To increase your protein intake per serving and achieve a delicious milkshake taste, use non-fat or low fat milk instead of water. Recommended Use for Females: As a dietary supplement, take 1 scoop (providing 25 grams of protein) with 8-12 oz. of cold water or any beverage you prefer. Vary the amount of liquid to achieve your desired consistency. Consume 2-3 times daily for optimal body shaping requirements. To increase your protein intake per serving and achieve a delicious milkshake taste, use non-fat or low fat milk instead of water. Cocoa Powder, Inulin, Natural & Artificial Flavors, Sodium Chloride, Sucralose, Acesulfame Potassium, Potassium Citrate. This product contains milk, egg, and soy. This product was produced in a facility that may also process ingredients containing milk, egg, soybeans, shellfish, fish, tree nuts, wheat and peanuts. Cocoa Powder, Marshmallow Pieces (Sugar, Rice Flour, Wheat Starch, Canola Oil, Dextrose, Natural and Artificial Flavors, Salt, and Titanium Dioxide), Chocolate Pieces, Inulin, Natural and Artificial Flavors, Sodium Chloride, Acesulfame Potassium, Sucralose, Soy Lecithin, Potassium Citrate. For Men: As a dietary supplement, mix 2 scoops (providing 48 grams of protein) with 8-12 fl. oz. of cold water or any beverage you prefer. Consume 2-3 times a day for optimal muscle growth. To increase your protein intake per serving and achieve a delicious milkshake taste, use skim or low fat milk instead of water. For Women: As a dietary supplement, mix 1 scoop ( providing 24 grams of protein) with 4-6 fl. oz. of cold water or any beverage you prefer. Vary the amount of water to achieve your desired consistency and taste. Consume 2-3 times a day for optimal body shaping requirements. To increase your protein intake preserving and achieve a delicious milkshake taste, use skim or low fat milk instead of water. Packed by weight, not by volume. This product is intended as a dietary supplement only. Do not use as a sole source of nutrition. Mix 1 scoop of COMBAT PROTEIN POWDER® with 8–12 . oz. of cold water. Vary the amount of water to achieve desired consistency and taste. To increase your protein intake per serving and achieve a delicious milkshake taste, use skim or low fat milk instead of water. Consume additional servings throughout the day to meet your daily protein requirements. Use in combination with whole food protein sources, a balanced diet, and exercise program. Due to the amount of active ingredients in this product, shake weekly and before use to ensure proper ingredient mixture and effectiveness per serving. Packed by weight, not by volume. Settling of product occurs after lling. Do not use if tamper evident security feature is broken or missing. Exposure to heat, light or air can affect avor or aroma; therefore keep out of direct light or heat and store in a cool dark place. Keep sealed when not in use. ALLERGEN WARNING: CONTAINS MILK, PEANUT, EGG, SOY (Lecithin). Made in a facility that may also process egg, tree nuts, sesame, peanuts, fish, crustaceans, shellfish, and wheat products. Recommended Use for Males: As a dietary supplement, take 2 scoops (providing 48 grams of protein) with 8-12 oz of cold water or any beverage you prefer. Consume 2-3 times daily for optimal muscle growth. To increase your protein intake per serving and achieve a delicious milkshake taste, use non-fat or low fat milk instead of water. Recommended Use for Females: As a dietary supplement, take 1 scoop (providing 24 grams of protein) with 8-12 oz. of cold water or any beverage you prefer. Vary the amount of liquid to achieve your desired consistency. Consume 2-3 times daily for optimal body shaping requirements. To increase your protein intake per serving and achieve a delicious milkshake taste, use non-fat or low fat milk instead of water. People who train hard demand a superior and more effective protein. 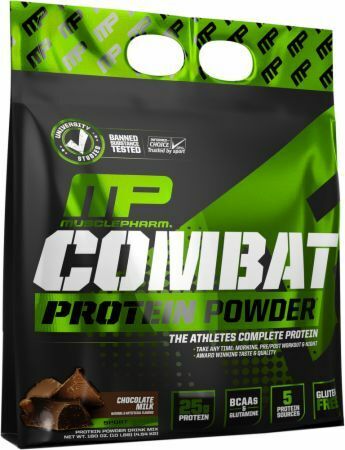 To maximize muscle growth and ensure proper protein utilization, MusclePharm scientists fortified Combat Powder with a variety of protein blends that digest at varying rates, for up to 8 hours. * The great-tasting, easy-mixing digestive blend is fine tuned for true nutrient utilization - a step ahead in protein powder technology. Most supplement companies seem to be okay with the status quo, the minimum. But ask yourself: do you give your workouts minimum effort? MP scientists over-delivered. Combat Powder is precision-engineered with whey protein concentrates, hydrolysates and isolates, egg albumen, and micellar casein. Triple Berry This is a Buy 1 Get 1 FREE offer!